Techtribe - We demand innovation and have a thirst for new technology. 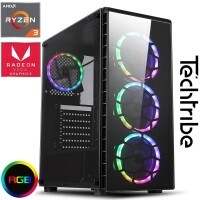 Techtribe is a new exciting UK manufacturer of PC units using only quality components from worldwide known brands. For home, gaming, organisations, education & companies that require advanced computing power for tasks such as gaming, design, data processing and advanced office tasks or everyday household, networking and socialtasks, our range of performance business PCs take advantage of the latest high performance components and deliver a staggeringly quick and powerful computing experience at an amazing low price. When comparing prices, please note all our components are of the latest generations and brand new, some of our competition use old generation, refurbished components such as CPUs & motherboards to give the impression of value ... beware!